in the Cappadocia region. The town is located on the banks of the River Kizilirmak (ancient Halys). 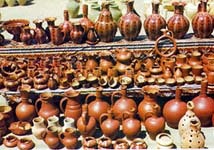 The distinctive red clay from the river is used in pottery-making. There are about 300 workshops in the region producing hand made crafts. If you drop into one of them, staff are friendly and welcoming to anyone who wishes to try his or her hand at the wheel.